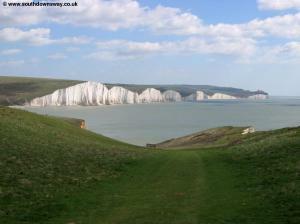 This walk begins from the coastal town of Seaford a short distance from the South Downs Way. 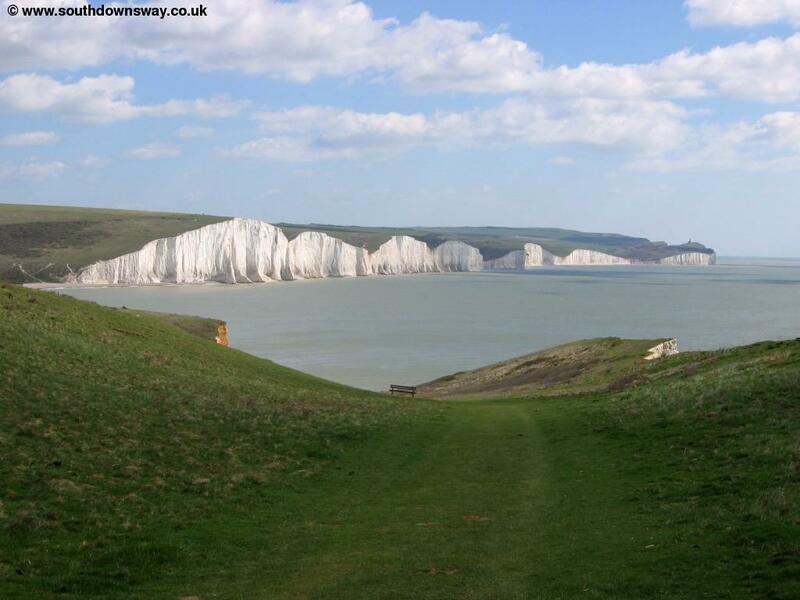 Passing over Seaford Head you get fantastic views of the path over the Seven Sisters ahead then head inland to follow the banks of the river Cuckmere through Westdean, Litlington and Alfriston. 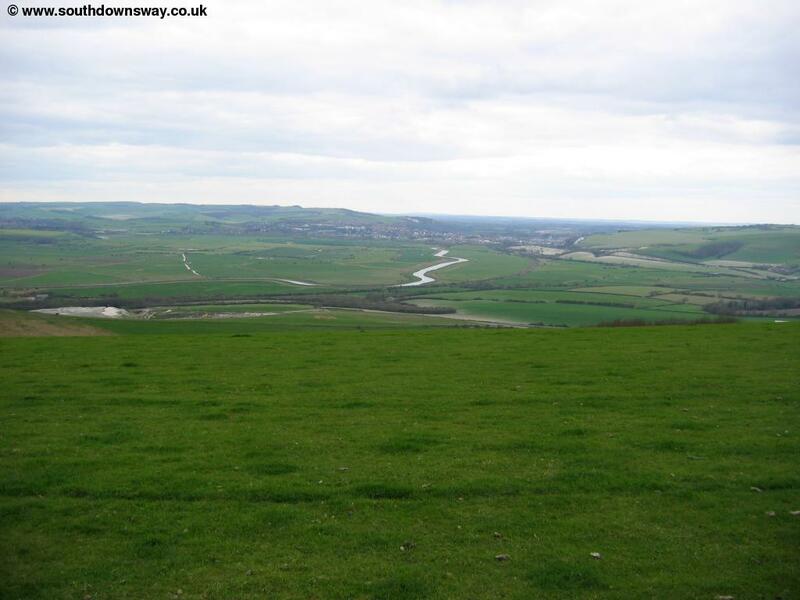 From Alfriston the path climbs onto the downs offering stunning views all around before descending to Southease, a few miles north of Newhaven. 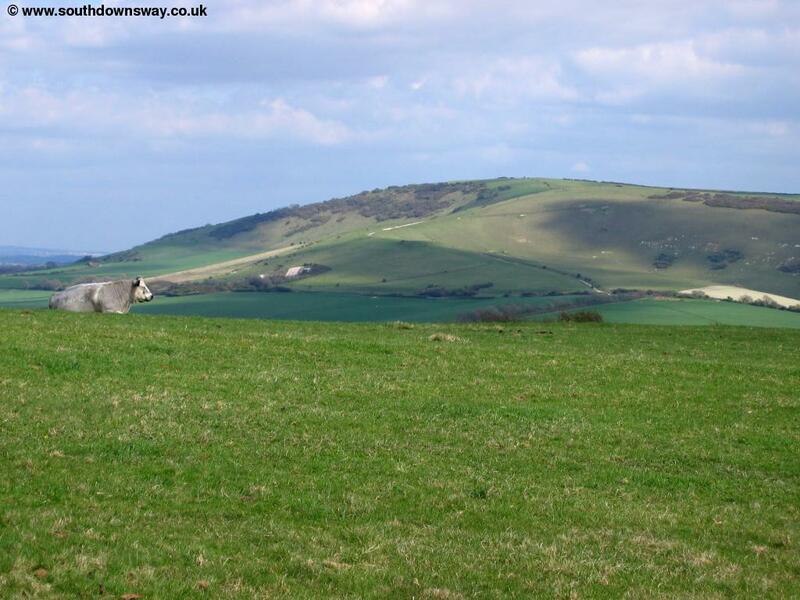 I originally planned to start this walk at Southease walking to Exceat, but the fine weather meant I decided to change plan and do the walk from Seaford, up to Exceat then in reverse instead. 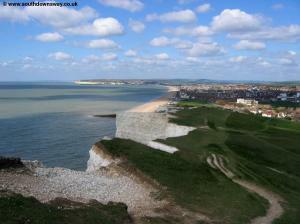 Seaford is on the south coast between Eastbourne and Newhaven. From the A27 from the west join the A26 signed to Newhaven at the roundabout. 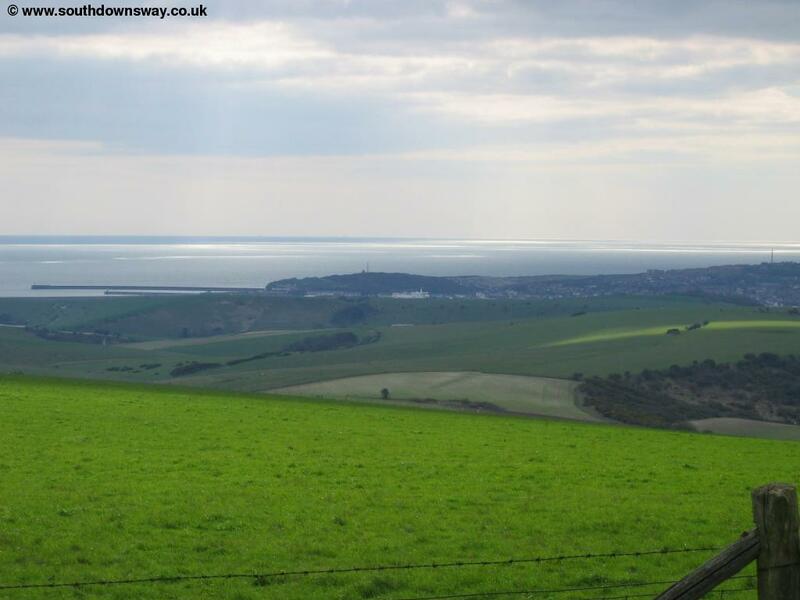 In Newhaven turn left when signed onto the A259 towards Seaford. 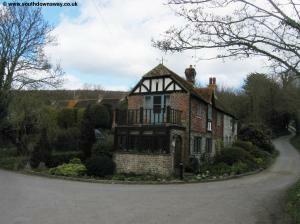 When you see the sign for Bishopstone Station take this turning onto the seafront. 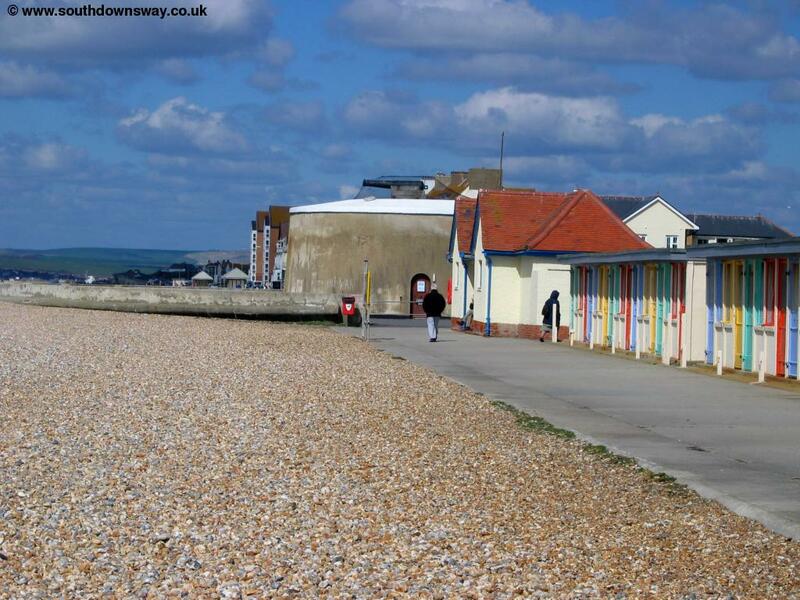 Follow the road along the sea front where you'll find a car park (currently free) on the seafront next to the Martello Tower. 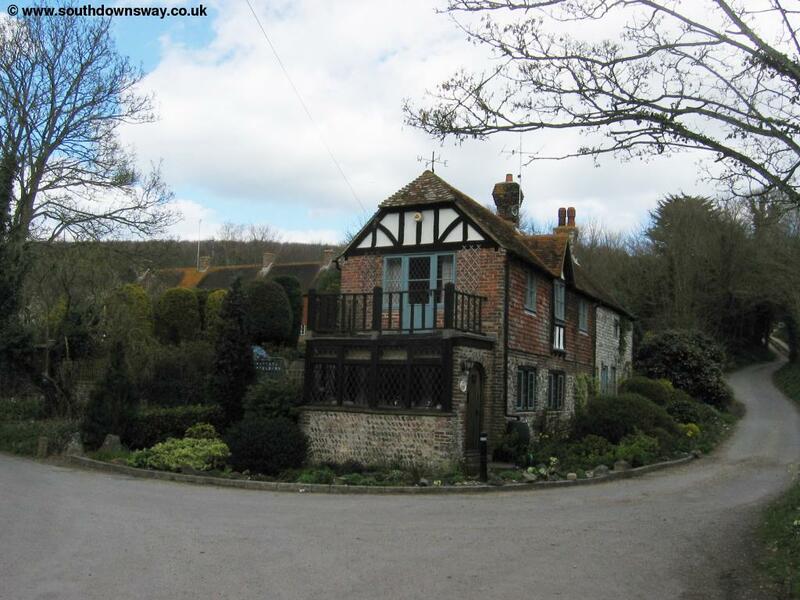 From the A27 from the east, turn off the A27 at the roundabout (signed for Alfriston). 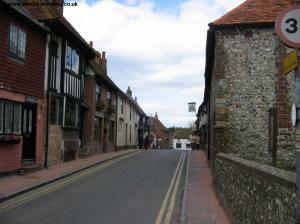 Continue through Alfriston into Seaford town centre. At the main road (Sutton Road) turn left then almost immediately into Right into Arundel Road and take the 3rd right (Sutton Avenue). At the end of Sutton Avenue, continue into Steyne Road then take the second left (Cricktfield Road) and at the end of this road continue straight on to the car park. 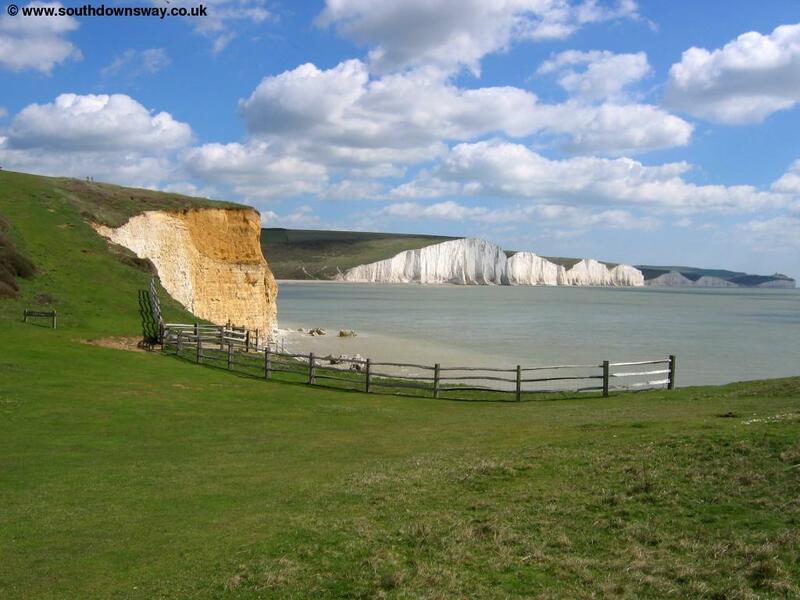 By public transport, Seaford has trains every 30 minutes Monday to Saturday and hourly on Sunday, operated by Southern from Newhaven, Lewes and Brighton. Connections are available at Lewes for Eastbourne, Haywards Heath and London (Victoria). Seaford also has frequent buses from Hove, Brighton, Peacehaven, Newhaven, Exceat and Eastbourne on route 12 (operated by Brighton and Hove) and 712 (operated by Stagecoach). 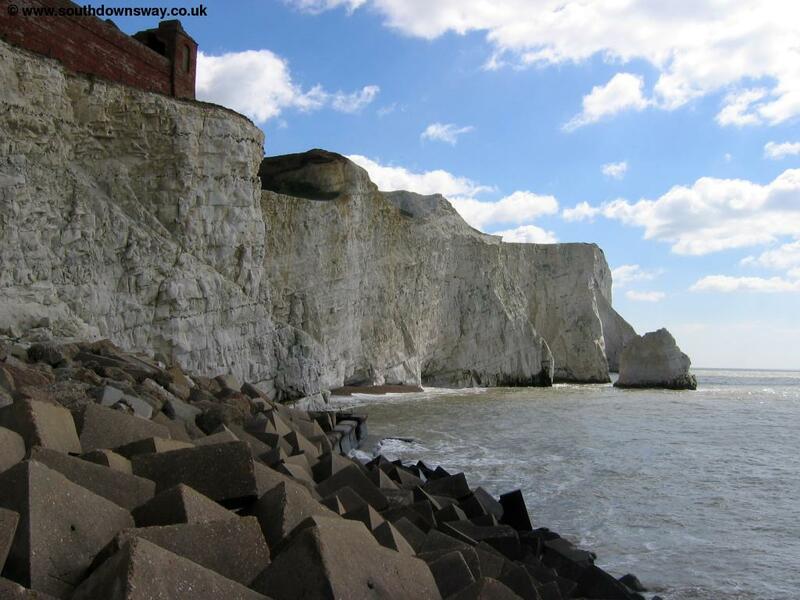 This walk begins from the Martello Tower in Seaford (the museum), rather than on the South Downs Way. 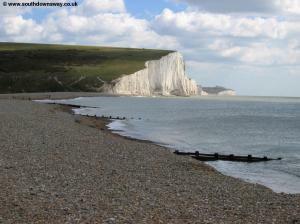 Seaford is a fairly quiet seaside town just up the coast from the port of Newhaven with a shingle beach. Walk along the seafront east (with the sea to your right), past the row of beach huts. At the end of the promenade it's worth taking a quick look round the next bay where the path ends. Here follow the footpath onto the cliff top (signed Vanguard Way). Take care here as there is a steep drop from the cliff edge as well as a golf course next to the path. 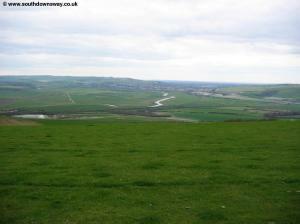 The views back over Seaford and Newhaven as you climb up are impressive. Soon you reach the top of the headland where you'll see a sign welcoming you to Seaford head. The path is obvious here, following the edge of the cliffs. Soon you get your first view of the beautiful Seven Sisters cliffs ahead, which the next walk will cross. The path descends slowly down towards the small beach, where there are stairs down to the beach. There is access down to the beach here (via a fairly recent looking staircase), but you can't walk along the beach here (at least not at high tide anyway). The path continues to the left up the hill and past a row of cottages on the right. The classic view of the Seven Sisters is seen from here, with the cottages providing the foreground and the cliffs the beautiful background. 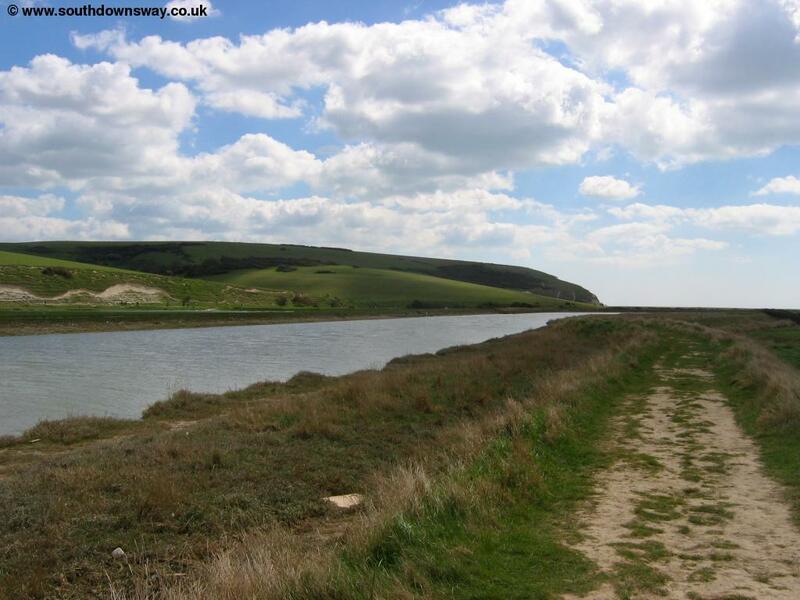 From here the path descends towards the shingle beach at Cuckmere Haven. 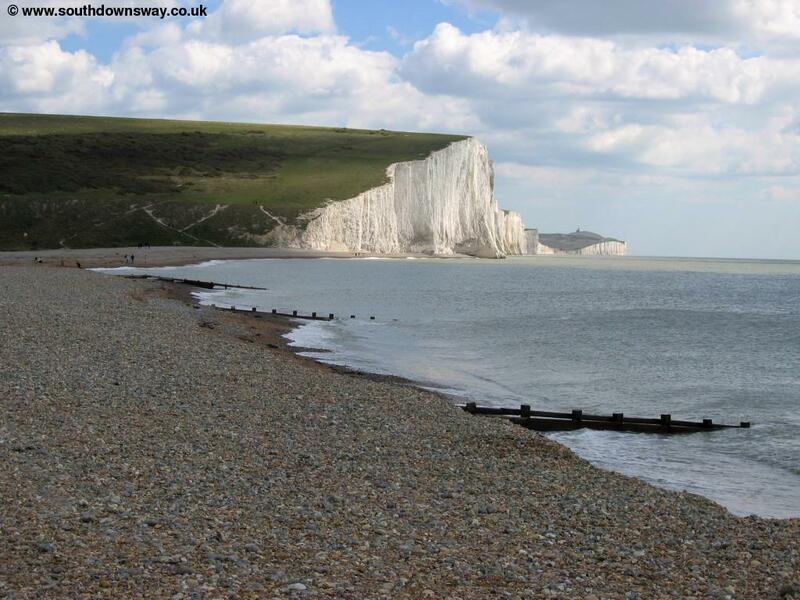 At the beach it looks as if you can continue walking along the beach past the Seven Sisters, but in fact the Cuckmere River flows out to sea here and the crossing is not for another mile or so inland at Exceat. Follow the path on the left edge of the river towards Exceat. Beyond the natural course of the river can clearly be seen and cattle, horses and sheep are often to be found grazing on the water meadows beside the water. Soon the path comes towards the road and it exits into a pub car park. Walk through the car park to the road and turn right, following the edge of the road. You'll need to cross the path to get to the footpath, then back again on the other side of the bridge, so take care as it's a busy road. 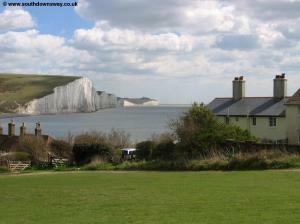 Soon you come to the large car park of the Seven Sisters Country Park, on the corner by an unusual green telephone box. 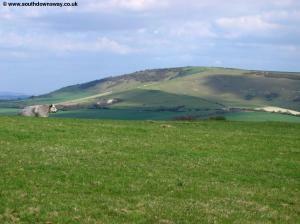 Here the we re-join the South Downs Way heading North, which can be found next to the bicycle hire shop. There is also a visitor centre, toilets, cafe and shop here. 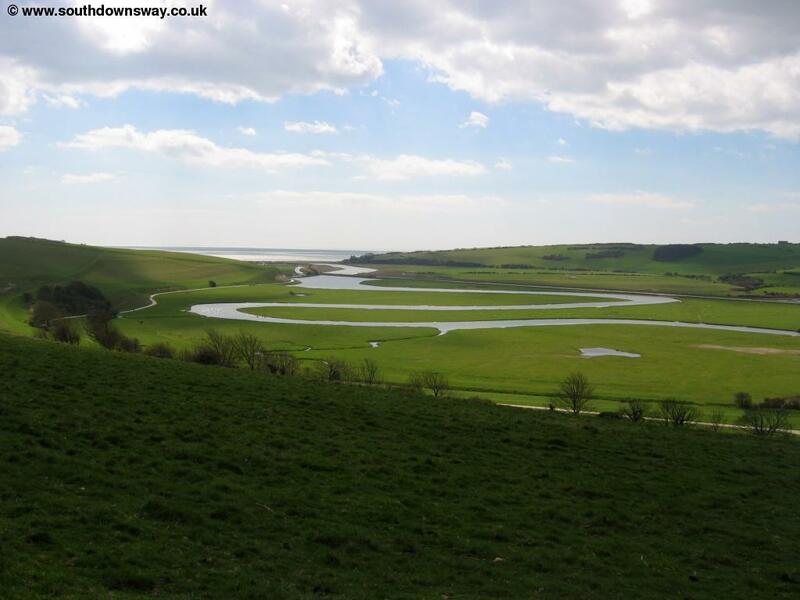 Once past the buildings you emerge into a field which the path climbs up, offering excellent views of the Cuckmere River below and beyond to the coast. At the top of the hill you cross the wall (an unusual stile!) and then begin to climb through the woods (the edge of Friston Forest). Note that the signage for the next few miles is fairly poor in my view. 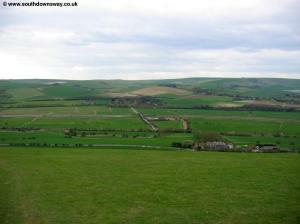 At the junction of paths continue straight on descending to the tiny but beautiful village of Westdean. Follow the road straight on past the pond on the left and keeping the church to your right. At the junction of roads the signage is confusing with arrows (but not for the South Downs Way) pointing to the right, look out for the stone South Downs Way sign straight on up this track, however it is worth taking a brief diversion to look at the church and other old buildings in the village. The path now climbs back out of the village passing the white horse in the hills to the left then back into the woodland where the path soon turns to the left and heads through the trees. The woods here are a popular spot with families and probably provide a welcome break from the sun in summer. As you come to a junction of paths there doesn't appear to be any signs, but the correct way is down the steep flight of stairs on the path ahead. You're passing the grounds of Charleston Manor on the left. Continuing straight on the path now climbs up through fields passing Clapham Barn on the right as you approach the top of the hill. At the top of the hill you have views to the left over the river once more. The path now descends through the fields towards the village of Litlington, with it's attractive stone buildings and the church a little to the north. 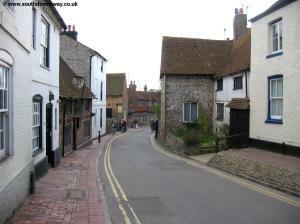 The path joins the main street through the village, passing a pub on the left. Look out for a small alley between houses just after the pub (there is a wooden post here). Follow this path down to the river valley. 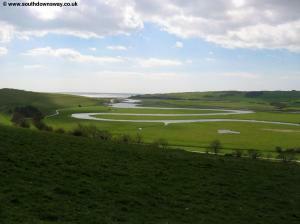 Here you turn left to follow the initially reed-filled river before it opens out to the north. 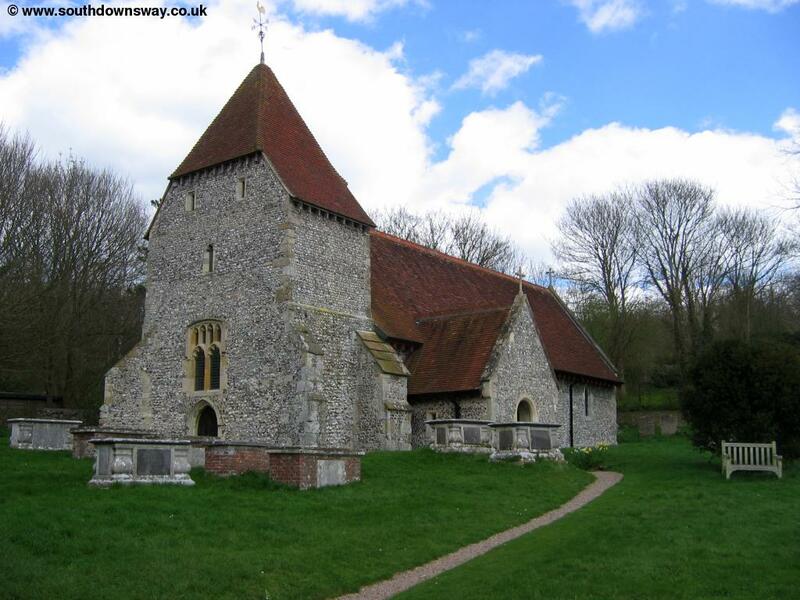 The South Downs Way now follows the path along the banks of the river north to Alfriston, a walk of rather different character from much of the South Downs Way. Soon you can see the beautiful church in Alfriston beside the river, looking rather isolated from the rest of the village. 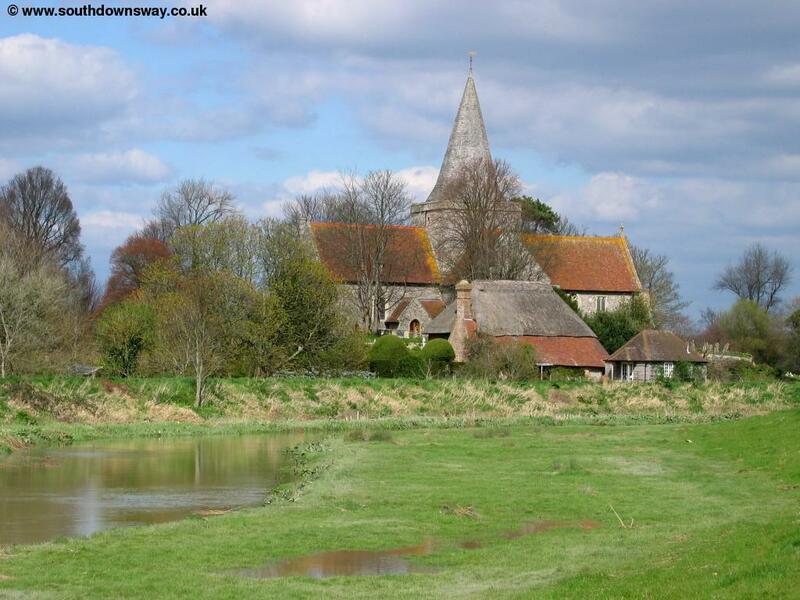 The river curves round beside the church so it initially looks as if the church is on the right of the river until you get closer. As you come closer to the church there is another stream to your right which seemed to be covered in some sort of red algae when I walked here. 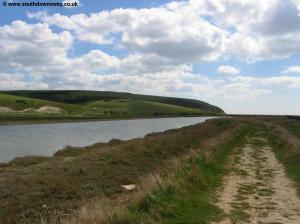 Soon you see the attractive white bridge that crosses the river Cuckmere. Turn left and cross the pedestrian bridge, coming towards the large green beside the church. 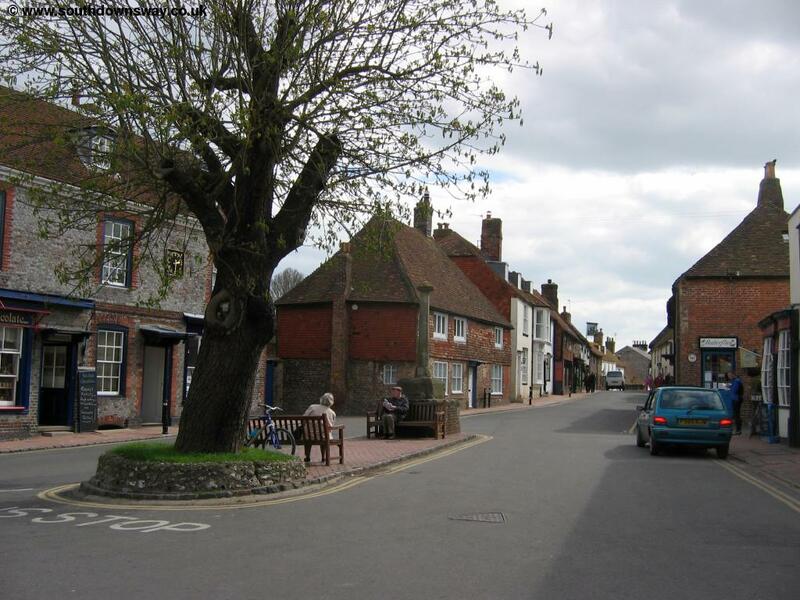 The path is poorly signed through the village, but the intended route is to turn right once across the bridge then take the road on the left (River Lane), emerging into the centre of this lovely village. The correct route through Alfriston is to turn left and take the narrow path beside the post office then continue down Kings Ride as it climbs away from the centre of the village past more modern housing. 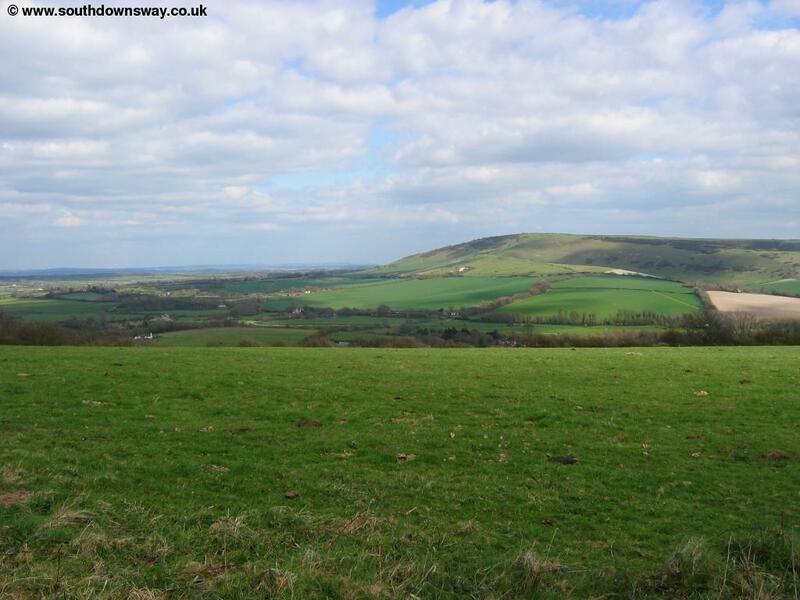 At the top the road turns to the right (The Broadway) but the South Downs Way continues straight on, climbing back onto the top of the downs. From here on the path appears to be well-signed once more and as it follows the top of the downs it's difficult to go wrong. 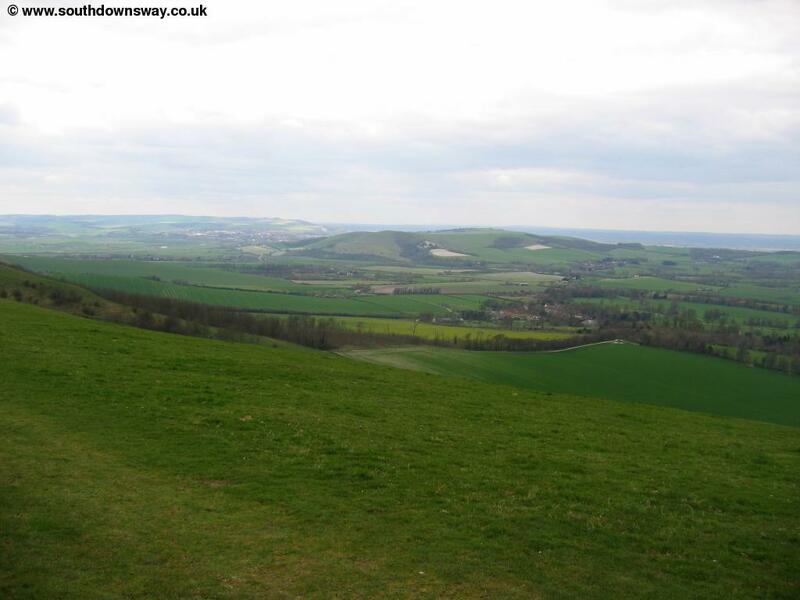 As you climb towards the top of the downs, the path turns to the right to reach the summit of Long Burgh offering lovely views back towards Alfriston and out to sea. Continue straight on here as the path climbs a bit more to the very top of the hill. The path undulates a bit more ahead, soon coming to the small car park just on from Bostal Hill, with the remains of an old quarry to the north and beyond, Arlington Reservoir. 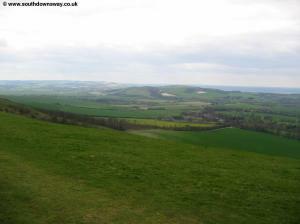 The path climbs away from the car park then remains fairly flat to the next hill top at Firle Beacon. From here you have good views to the north and also of the sea and Newhaven to the south. Oddly the path around this area seems to be fenced in for much of the way. Continue past the edge of some woods to the north to another small car park then on towards the hill with the two tall radio masts, a rather ugly addition to the landscape. 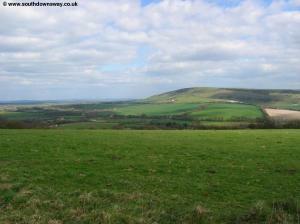 However at the top of this hill you have good views over the downs to Lewes in the distance. 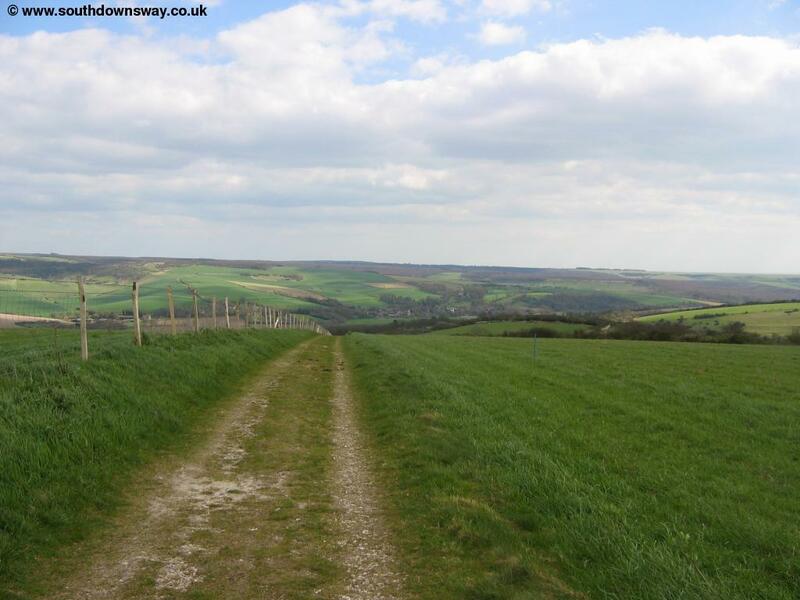 The path heads to the top of another small hill from the radio masts where you can see the river Ouse to the right, emerging at Newhaven which you can see to the left. 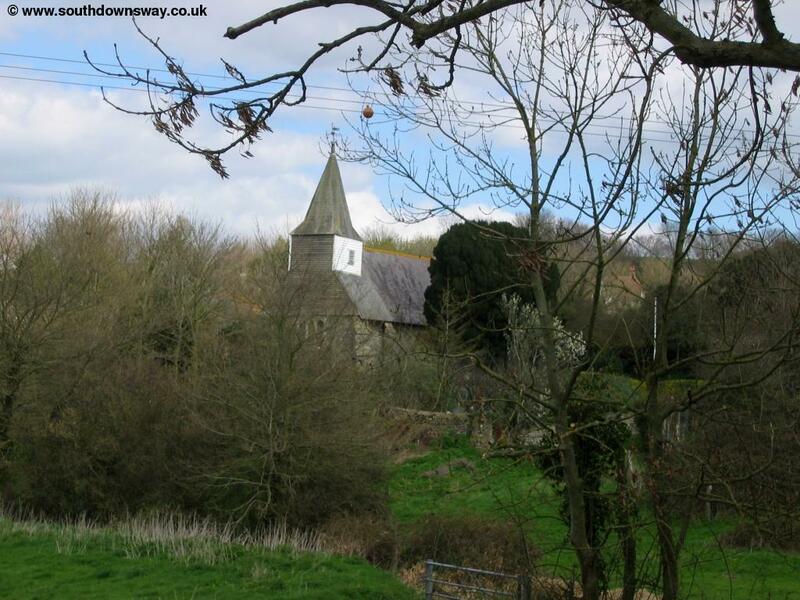 Soon you pass over the last hill with a view below to the A26, Iford Farm, the railway line and Southease station, the River Ouse and swing bridge and beyond to Southease village with it's pretty church. From Iford Hill Southease may be straight below, but the path turns left through the field, with a warning sign to stick to the official route and not cause erosion by walking straight down the hill. This land is marked as access land on the map so technically you can take this route, but you'll find a fence at the bottom. 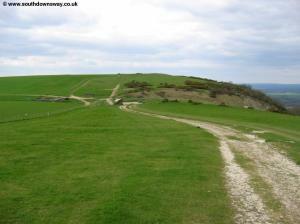 Instead you head left slowly descending before joining a worn chalk track as the path turns back to the right. 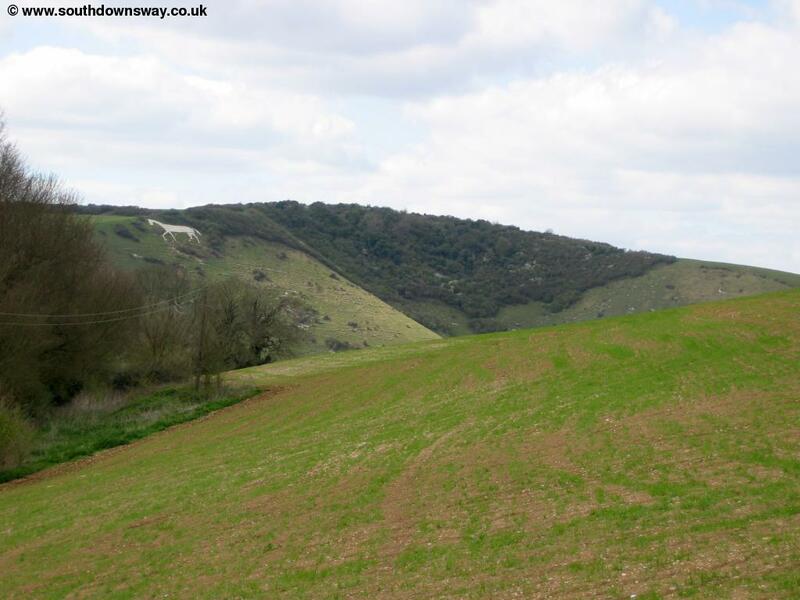 At the edge of the hill the path descends to the busy A26 road. Here the path turns briefly right before crossing the road (take care here as it's busy) towards Iford Farm. You then follow the track through the farm yard (where there is also a tap and a B & B). 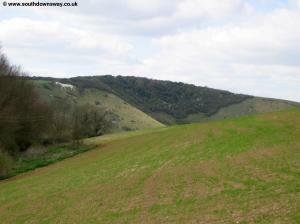 This then comes a track to Southease station, the end of this walk. To continue into the village you need to cross the line via the bridge then cross the swing bridge over the river and on into the pretty village. The easiest way to get back is by train. 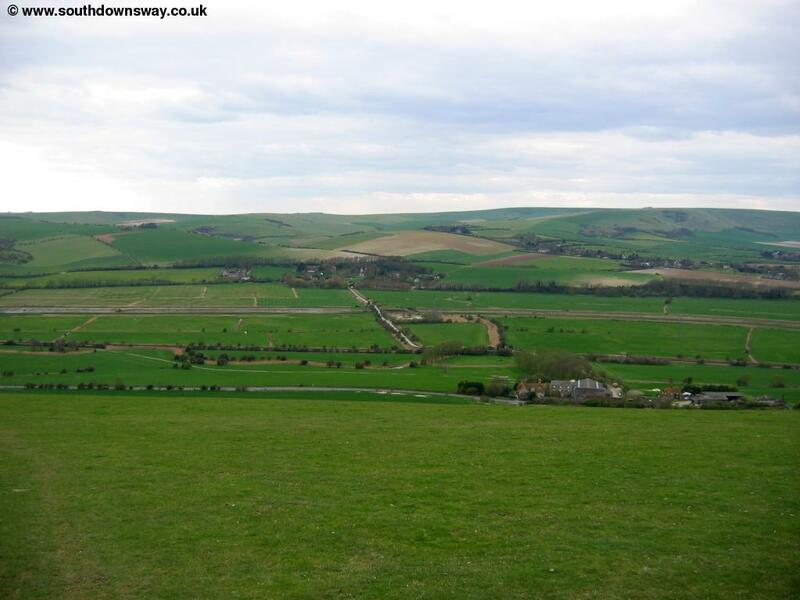 Despite being a tiny and fairly remote station, Southease has an hourly service (7 days a week) to Lewes (for connections to London Victoria and Eastbourne), Brighton, Newhaven and Seaford as well as through trains to London at peak times, all operated by Southern. Note that information at the station is basic to say the least, but the platform you come to from the A26 is for trains to Newhaven and Seaford, whilst the opposite platform is for trains to Lewes and Brighton. There is also a bus service from Southease, number 123 (operated by Renown Coaches) which goes to Lewes, Newhaven and Peacehaven a few times a day (infrequent on Saturday and no service on Sunday). This company does not appear to have a website however.